I've been waiting months and months since the pomegranate blossoms started showing to bear fruit. Finally! Pomegranates are in season! These yellow pomegranates are the sweetest ever. No tartness like the red variety. I only have about half a dozen fruit on my tree, nothing like my second-youngest uncle's pomegranate trees. I thought eating pomegranates were rather self-explanatory, but I guess not. Twice now I've seen people trying to eat this with a spoon. Well, you can, but usually after you've removed the seeds from the peel. Just make a small slice into the side so you don't cut into the whole fruit and spill all that lovely antioxidant juice. Then split in half like so. Then just section and peel off the seeds into a bowl, toss away the thin membranes and outer peel. I've seen some people peel pomegranates into a bowl of water, but that wastes too much of the precious juice for me. Until you have a gorgeous pile of jewel-like seeds. Then you can eat this with a spoon. And my favorite recipe for pomegranates -- Fessenjan (Persian Walnut-Pomegranate Glaze with Roast Duck). 1 year ago today, the first time I fell in love with Bollini's Pizzeria Napolitana - Monterey Park. Love the colour of pomegranates-especially in a fruit salad! I have found that the best way to get the seeds out of the shell is to cut it in half. Crack the sides of one half, in several spots. then turn it over onto hand, cut side down, and smack it with a big wooden spoon to knock the seeds out. do this over a big bowl. By the way, I am enjoying the recipes. thanks. Excellent! I've been waiting for pomegranate season, and now that you've given official word WC, I will see if I can find any at the farmer's markets. I've never seen yellow skinned pomagranates. Love the regular ones, and almost bought one this weekend but it just looked so little. I have never tasted pomegranates before. Had it in juice form only. Your photos are so beautiful! 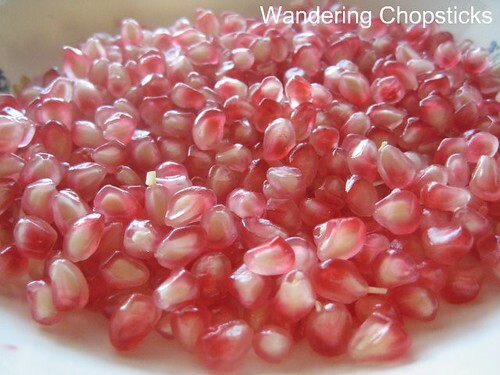 The pink pomegranate seeds almost look like delicate glass beads. Lovely! 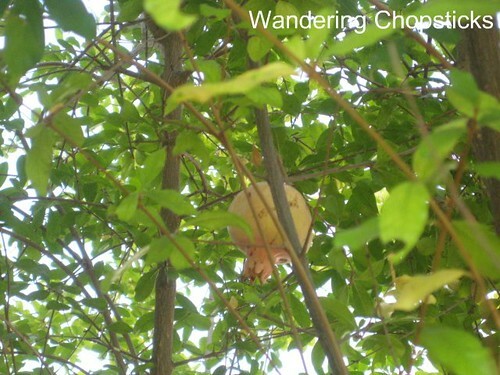 I've never had pemegranates before (always are too expensive for me), but maybe it's time to make a splurge. The seeds look bursting with flavour. Gorgeous! I am so astounded today. I keep reading about fruit with unexpected skin colors! I'm adding this to my list of fruits I want to find. 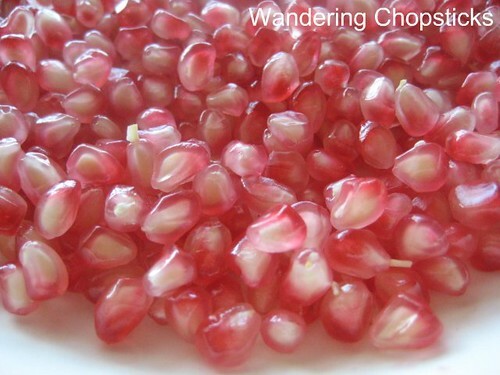 I've only had red skinned pomegranates with dark red seeds. I love them too, but I still wish there was an easier way to get all the little seeds out! It can take a while to get them all out. Whacking it with a wooden spoon? I'm afraid that will cause too much bruising and waste the juice. It's work to eat a pomegranate, but so worth it. Haha. As if you wouldn't see them popping up anyway when they're in season. Prior to this, I had only seen the red ones too. And while they looked nice and all, they were always too tart for me. They're just starting to come into season so maybe you'll see bigger ones later. In juice form, I think pomegranates taste too much like cranberries. There's a world of difference between this flavor and juice. If you were closer, I'd give you some. Thanks! Glass beads huh? I was thinking jewels but yes, I think glass beads are an apt description. It's always good to try new things. Beware though, the red kind tend to be tart so you may be disappointed. It's good to search out new foods. I hope you find some, but this kind is fairly uncommon. 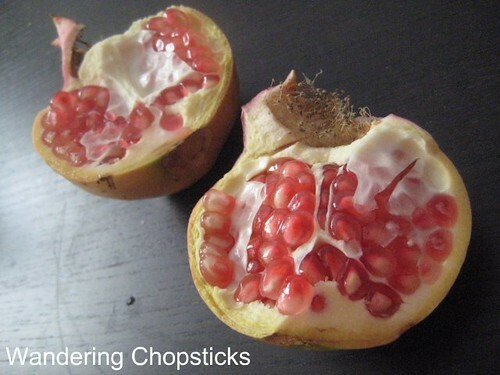 I wonder if it's a specific VNese pomegranate strain. It is so much work. I get lazy. And I gobble them all down in a fraction of the time it took me to peel them. I've never heard of a yellow pomegranate. Those seeds are GORGEOUS! I can't get over how pretty they are. You are so lucky to have your own tree. I'll have to keep my eyes open for the yellow variety. My cousin gave me a bunch earlier this month and even though they were quite annoying to "de-seed" it was so worth it! I dunno where California gets their trees, here in Florida most fruit trees I found are lemon. You're not supposed to eat the rind. I don't know where you are in Florida, but a lot of tropical fruits these days are being grown there and shipped across the U.S.